ISO 9001 Definition: ISO 9001 is a set of internationally agreed standards that provide guidelines for a Quality Management System. If you are interested in the history of the standard, read this. States to your customers that you have certain key Quality Assurance Systems in place and you are following these systems. Some customers may only do business with ISO 9001 companies. 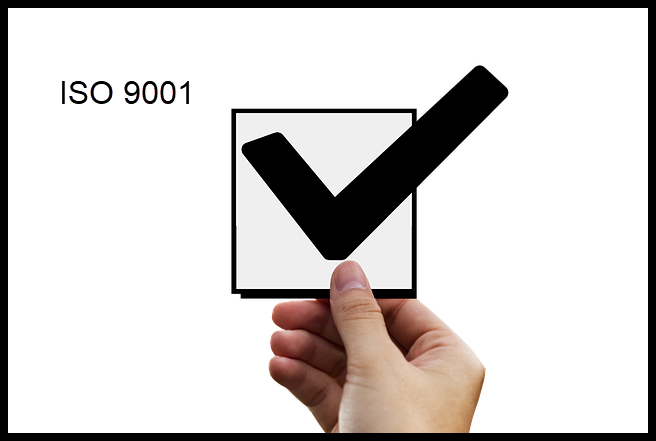 The ISO 9001 definition provides the basis for other certifications such as IS0 14000 (environmental), TS 16949 (automotive), and AS9100 (aircraft). It drives improvement within your company. It could reduce customer audits of your facilities, processes and systems. It drives and changes your company to systematic method of management and work. If you are getting ready to select an ISO 9001 auditor, review this first. How did you SURVIVE your ISO Audit? Please post your story. Click here to review other's experiences. As mention above the standard can be used for any type of organization. The standard is generic and universal. Third party registrars use the standard as a basis for auditing. It requires top level management commitment to achieve the certification. The ISO 9001 standard does not determine your company’s quality goals. It does not put numbers on defect levels or other quality characteristics. It is not a measurement tool. The standard lets you prescribe your systems but you must meet the intent of the standard. Your Quality Management Systems will look different then other organization’s systems. To achieve certification you must “walk the talk”. Within this website you will find recommendations for these systems. See the mandatory document list for ISO 9001 certification. Looking for a Registar? Here is a list. Did you know that RAB / ANSI / ASQ have very strict requirements when it comes to using their logo? If you want to know more, click here. Review this page for the 5Ws of the ISO Quality Audit. When writing ISO Documentation, it is best to start with flowcharting your systems and processes. Learn to build an efficient QMS and convince Management to invest. This page describes additional reasons for creating a QA Manual.